Dallas Movie Screenings: Teen Titans Go! “Teen Titans” got their own movie after appearing on television. For the first time in the studio’s history since “Batman: Mask of the Phantasm,” Warner Bros. and DC release their anticipated movie based on the reboot series on Cartoon Network. This superhero film is widely entrenched for their blockbuster landscape and for action-movie genre (even if this is a movie for kids). Cartoons aren’t just for kids, but also for teenagers and parents. Compared to the reboot series, this film features the returning cast from the television series and the setting also takes place in the same time period. Additionally, few newer cast join the party: Will Arnett as Slade, Nicholas Cage as Superman and Kristen Bell as the Jade Wilson, the director. 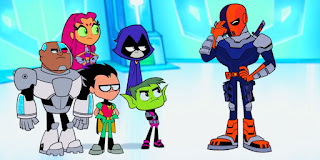 In this film, The Teen Titans, comprised of Robin (Scott Menville), Raven (Tara Strong), Beast Boy (Greg Cipes), Cyborg (Khary Payton), and Starfire (Hynden Walch), desperately wanted to their own movie, mostly Robin, under the director Jade Wilson (voiced by Kristen Bell) in order to become great superheroes. The main problems are they can’t help themselves seriously as they just making things a lot worst and they need an archenemy. The plot from this film is somewhat rough to see and sometimes this film feels like a several episodes from the series have put altogether in one showcase. The scripting-writing is catchy and compelling just like 2017’s “The LEGO Batman Movie.” The main five actors done an outstanding job of keeping their acts together while Arnett keeps his Slade character more juicy, but funnier as it looks. The Slade character who looks like Deadpool would led this film to believe it is a “Deadpool movie for kids.” The dark comedy also works perfectly, thought there are some disturbing scenes for kids to watch out as time flies by so quick. Since this film is animated, it is easiest genre to digest for children and parents. The jokes are highly humorous and break the fourth wall, such as Green Lantern being a flop, Slade (voiced by Will Arnett) being mistaken as Deadpool, “Guardians and the Galaxy,” the Warner Bros. water tower being a home for “Animaniacs,” the theme song from “Back to the Future,” and the Marvel comic-book titan Stan Lee appears as a cameo, though this is a DC film. My favorite part from most of the film are the jokes from superhero films, the Warner Bros. Studios backlot which serves as the film’s main climax, and the Stan Lee cameo, which gave this film bonus points (he even shoots his signature phrase “Excelsior” to add more comedy). This is the first time Lee appears in DC film. Nuff said! Overall, “Teen Titans Go!” is an amazing film for kids and parents. My main opinion is people can come here to see the action, comedy from the characters and DC superheroes, and the sharp jokes the cast have brought out to child audiences. “Teen Titans Go!” may not be the best of being the biggest superhero movie ever or the biggest animated movie of the year, but this film is the best bet for children and DC fans when it comes to superhero movies regardless. It serves as a promotion for the Cartoon Network series and it actually works. I hope you enjoy “Teen Titans Go!” to live up your expectations at home. Running time: 88 minutes. As a bonus, don’t forget the DC Super Hero Girls short film, about a Batgirl wants to get there on time to fight with other DC superhero girls against their enemy. The short film also adds a touch for a big-screen presentation.